introducing any changes to your diet or level of physical activity. Q and Me helps people lose weight—sensibly, healthily, effectively by encouraging proper nutrition and increased physical activity. It provides helpful information and resources to keep you motivated between office visits. Q and Me helps you understand your unique habits, gain skills to overcome barriers to​ weight loss, and provides guidance for changing your diet and lifestyle. 25 Steps for Success offers nutrition education and behaviour modification advice. Each step focuses on a unique subject and offers a set of corresponding goals. Could This Medicine Be Right for You? Body mass index (BMI) is a measure of body fat. Enter your weight and height to calculate your BMI, and then talk with your healthcare provider to see if Qsymia may be right for you. Our money-saving offer helps you get started on your path to achieving your long-term weight‑loss goals and continues to support you throughout your journey. Restrictions apply. Do not take Qsymia if you are pregnant, planning to become pregnant, or become pregnant during Qsymia treatment; have glaucoma; have thyroid problems (hyperthyroidism); are taking certain medicines called monoamine oxidase inhibitors (MAOIs) or have taken MAOIs in the past 14 days; are allergic to topiramate, sympathomimetic amines such as phentermine, or any of the ingredients in Qsymia. See the end of the Medication Guide for a complete list of ingredients in Qsymia. Birth defects (cleft lip/cleft palate). If you take Qsymia during pregnancy, your baby has a higher risk for birth defects called cleft lip and cleft palate. These defects can begin early in pregnancy, even before you know you are pregnant. Women who are pregnant must not take Qsymia. Women who can become pregnant should have a negative pregnancy test before taking Qsymia and every month while taking Qsymia and use effective birth control (contraception) consistently while taking Qsymia. Talk to your healthcare provider about how to prevent pregnancy. If you become pregnant while taking Qsymia, stop taking Qsymia immediately, and tell your healthcare provider right away. Healthcare providers and patients should report all cases of pregnancy to FDA MedWatch at 1-800-FDA-1088, and the Qsymia Pregnancy Surveillance Program at 1-888-998-4887. Increases in heart rate. Qsymia can increase your heart rate at rest. Your healthcare provider should check your heart rate while you take Qsymia. Tell your healthcare provider if you experience, while at rest, a racing or pounding feeling in your chest lasting several minutes when taking Qsymia. Suicidal thoughts or actions. Topiramate, an ingredient in Qsymia, may cause you to have suicidal thoughts or actions. Call your healthcare provider right away if you have any of these symptoms, especially if they are new, worse, or worry you: thoughts about suicide or dying; attempts to commit suicide; new or worse depression; new or worse anxiety; feeling agitated or restless; panic attacks; trouble sleeping (insomnia); new or worse irritability; acting aggressive, being angry, or violent; acting on dangerous impulses; an extreme increase in activity or talking (mania); other unusual changes in behavior or mood. Serious eye problems, which include any sudden decrease in vision, with or without eye pain and redness or a blockage of fluid in the eye causing increased pressure in the eye (secondary angle closure glaucoma). These problems can lead to permanent vision loss if not treated. Tell your healthcare provider right away if you have any new eye symptoms. Mood changes and trouble sleeping. Qsymia may cause depression or mood problems, and trouble sleeping. Tell your healthcare provider if symptoms occur. Concentration, memory, and speech difficulties. Qsymia may affect how you think and cause confusion, problems with concentration, attention, memory or speech. Tell your healthcare provider if symptoms occur. Increases of acid in bloodstream (metabolic acidosis). If left untreated, metabolic acidosis can cause brittle or soft bones (osteoporosis, osteomalacia, osteopenia), kidney stones, can slow the rate of growth in children, and may possibly harm your baby if you are pregnant. Metabolic acidosis can happen with or without symptoms. Sometimes people with metabolic acidosis will: feel tired, not feel hungry (loss of appetite), feel changes in heartbeat, or have trouble thinking clearly. Your healthcare provider should do a blood test to measure the level of acid in your blood before and during your treatment with Qsymia. Low blood sugar (hypoglycemia) in people with type 2 diabetes mellitus who also take medicines used to treat type 2 diabetes mellitus. Weight loss can cause low blood sugar in people with type 2 diabetes mellitus who also take medicines used to treat type 2 diabetes mellitus (such as insulin or sulfonylureas). You should check your blood sugar before you start taking Qsymia and while you take Qsymia. High blood pressure medicines. If you are taking medicines for your blood pressure, your doctor may need to adjust these medicines while taking Qsymia. Central Nervous System (CNS) side effects. The use of prescription sleep aids, anxiety medicines, or drinking alcohol with Qsymia may cause an increase in CNS symptoms such as dizziness and light-headedness. Do not drink alcohol with Qsymia. Possible seizures if you stop taking Qsymia too fast. Seizures may happen in people who may or may not have had seizures in the past if you stop Qsymia too fast. 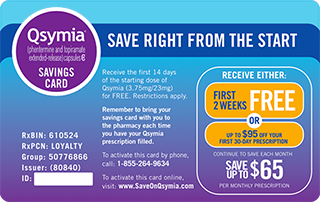 Your healthcare provider will tell you how to stop taking Qsymia slowly. Kidney stones. Drink plenty of fluids when taking Qsymia to help decrease your chances of getting kidney stones. If you get severe side or back pain, and/or blood in your urine, call your healthcare provider. Decreased sweating and increased body temperature (fever). People should be watched for signs of decreased sweating and fever, especially in hot temperatures. Some people may need to be hospitalized for this condition. Numbness or tingling in the hands, arms, feet, or face (paraesthesia); dizziness; changes in the way foods taste or loss of taste (dysgeusia); trouble sleeping (insomnia); constipation; and dry mouth. Tell your healthcare provider if you have any side effect that bothers you or does not go away. These are not all of the possible side effects of Qsymia. For more information, ask your healthcare provider or pharmacist. Call your doctor for medical advice about side effects. You may report side effects to VIVUS, Inc. at 1-888-998-4887 or FDA at 1-800-FDA-1088 or www.fda.gov/medwatch. The Q and Me Patient Resources and Education site is based on the LEARN® Program provided under copyright license (September 15, 2010). All rights reserved.